There is something fresh and lively about the tastes of the med. The flavours of herbs and citrus seem to call up the idea of the ocean breeze, and a warm sun. Bright blue waters and white sands come to mind, when I cook with Mediterranean flavours. I am originally from a Mediterranean country so these flavours are close to home. Bright salads, grilled fish or chicken, spices and herbs combined in just the right way so that you end up with a light happy dish instead of a warm, heavy one. The Sleekgeek competition inspired my recipe. The ingredients and method of cooking was very precise and I am so not used to it but I had fun doing it. Although I didn’t win the competition, I did win a delicious dish to add to my collection. There are small changes I would make from the original recipe and I will note them in the instructions. I will leave them in their original form too. That way those who would like something tasty and low-cal, can go ahead and have just that. A light, fresh chicken dish that has loads of flavour with little calories. For the low-carb crows, you can replice the rice with cauli rice and it works just as well. Get the rice cooking first. Rinse your rice until the water runs clear. Cook the rice according to the rice cooker or packet instructions. Peel your garlic, place it on a chopping board and using the flat of a knife and the palm of your hand crush the clove. Chop up the crushed clove. Sprinkle the tsp of salt onto the chopped garlic and using the very edge of your knife scrape the garlic toward you in a downward motion, using the salt as an abrasive to crush it. Alternatively, use a garlic crusher or grater. Squeeze the juice of half your lemon into the bowl. Add the herbs, salt and pepper and mix well. Set aside to allow the chicken to marinade. Side note: Do not be alarmed by the chicken going white. The acidity of the lemon will slightly cook the chicken. 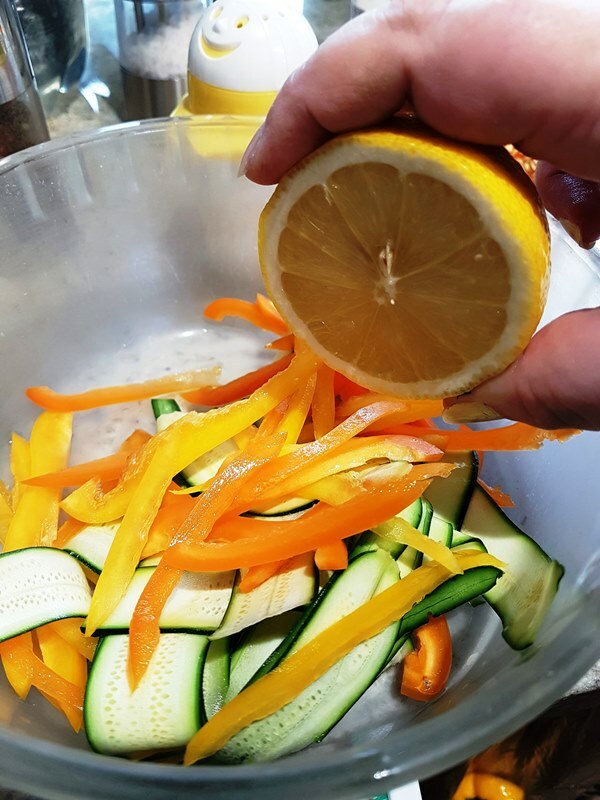 Using the vegetable peeler, slice the courgettes into strips. Slice your peppers as finely as you can. Put all the vegetables in a bowl and add the other half of the lemon juice, herb and seasoning. Side note: The courgettes will taste bitter at this stage but the pickling process will eliminate this. Slice up your onion and garlic. Add the garlic and then half a cup of water. 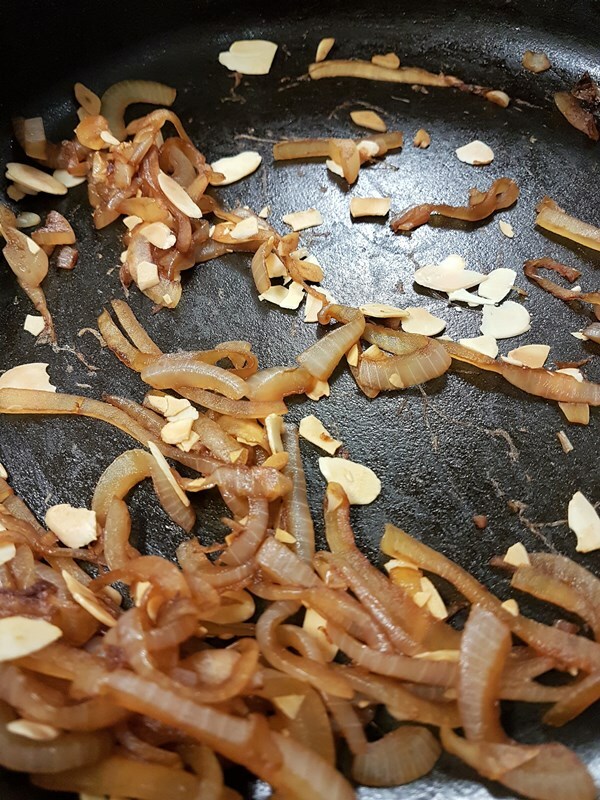 Hint: adding water to the onion and garlic prevents them from burning and allows you to get the same caramelised effect as using oil, just takes a bit longer, first boiling them until translucent and then the dry heat coaxing out the natural sugars. If the onions stick to the pan, deglaze with a little bit more water. Once browned. Add the almonds back into the pan for 10 seconds and then put the mixture into a big bowl. Once the rice is cooked, add it to the onions and almonds. Take the chicken pieces out of the bowl and put them in the hot pan making sure they are spread out. When they brown on the bottom flip them over and let them brown there to. If you don’t eat nuts you can leave them out.